Minerva, thanks for reminding me about those noodles - that would be the perfect food for only ten cents a meal! I was just reading on the news about the noodles and then came here. The governor pined wistfully for canned Progresso soups, but at $1.53 apiece, they would have blown the budget. He settled instead for three packages of Cup O'Noodles for 33 cents apiece. Those 99cent banquet frozen dinners are pretty good with two pieces of buttered bread and if you heat them for 4 min then put margerine on each section and then heat them again for 2 min. 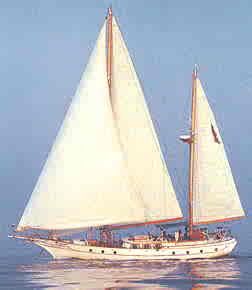 The Maranatha (As my mother named her) had blue sail covers when we owned it. But now it is used for tours as you can see here. When we lived on it anchored out in Lantana Florida we rowed even during storms out to the boat. We did not have electricity or water (we toted our water) but our experiences were full. I had a 14' cast net and caught bait fish for money and when I caught bigger fish like sheephead we had fish and squash for dinner. It was great growing up on the boat. Here I am at the site where our ship was anchored when I was 14 yrs old. From age 12 to 14 we lived on a 72' Chris Craft until the Gas shortage in the 70's caused my parents to go with the Ketch sailboat. Here is a pic of a 55 foot Chris Craft similar to the one we lived on in the Palm Beach Yacht Basin. During my six years alone, I owned a shack (farm) in Milton Florida and I lived on 400 dollars a month. I learned how to cook fried potatoes to perfection and when I went for long walks I would buy sardines as they gave me the protein to walk. You can't imagine how good they feel to your body when you are totally famished. I had to take the time to work on myself as many will soon experience so I did not work as that made me loose the connection to my moments in wonder. During the wonder I learned to draw what I needed without money as with money I would not have needed to draw. ( It is harder for a Rich man to enter into this kingdom life than it is for a camel to go through the eye of a needle.) The kingdom is the true gravity of the heart which when exercised through intent draws what you NEED in any given moment. This is short circuited by money as it is a god that replaces this synchronicity. (I am your water, I am your bread. Israel in wilderness) My true joy was to go walking with something on my heart that would eventually turn into poetry in my moments. As I walked I would gravitate to an experience related to "what is on my heart" and along with the experience my drink and food would show up each time in a different manner. So I did not fret leaving my home for days at a time without any money as "my life, showed up in the form that I needed". I also found that I had (knowledge, skills, etc) that was needed in the moment to help that other person that showed up with their car, television, whatever and usually the synchs had prepaired me to recognise what it was that they needed. I am a systems person, I always design systems for comfort but do not follow the mainstream in design. One of my favorite projects was when I lived alone in a small camper. I saw that my money situation was going to change and so I bought this cheap camper with the side splitting off for 400 dollars. I took my time while living in it to restore the water heater and the shower first then I went to work on other systems. I was very comfortable except that my camper was so small and did not look like the other campers in the rv park. I eventually traded up to a 26' wilderness model and then to a double tip out Royal International which I lived on the beach in Navarre Florida at the time for 150.00 dollars a month. I rarely use air conditioning but I go to the river (blackwater state park) during the heat of the day. I have also lived in my car because of fears because of my Synchronicity experiences early in the 80's as the church in Huntsville put the scare in those close to me over my writings. Through losing home so many times I came to love where ever I am at and find my living room any place such as has a fireplace and a coach. Now I am always at home with YOU, my life.